This recipe was adapted from a cookbook full of scrumptious southern style recipes mother-in-law gave me after a visit to Atlanta – Sweet Auburn Desserts. It’s been adapted to be gluten free as well as a reduction of sugar. I’ve learned over time not to be scared of traditional recipe cook books – while most of them are full of ingredients we need to stay away from for MJ, with a little creativity you can substitute and adapt almost any recipe to suit your dietary needs. These don’t last long in our house – as my daughter says “Mmmm.. These are my kind of muffins). *Note I use Agave instead of sugar when I have it on hand, or you can also use 1/2 cup unsweetened applesauce and 1/4 cup cane sugar. When mixing your wet ingredients be sure to add wet to wet and dry to dry when choosing your substitution. Bake the sweet potatoes at 375 degrees F for 1 hour (be sure to poke holes in them, and place a drip pan underneath in the oven to catch the ooey gooey goodness). Cool, peel and mash the sweet potatoes with a fork and set aside. Preheat the oven to 350 degrees F and grease your muffin tins or line with papers/silicone cups. Combine molasses, oil and eggs and mix well (here’s where you would add agave or your applesauce at this point also). Add your mashed sweet potatoes and stir well. Combine your dry ingredients – sugar, flours, baking soda, salt, and nutmeg in another bowl. Add in the flax and cereal. 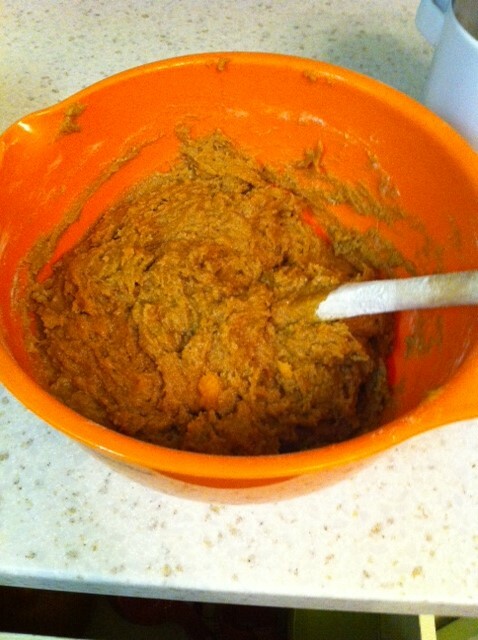 Add this to your sweet potato mixture and stir until just combined – your dough may look a little undermixed here – that’s ok.
Spoon batter into muffins cups and bake for 20-25 minutes until firm and/or toothpick comes out clean. 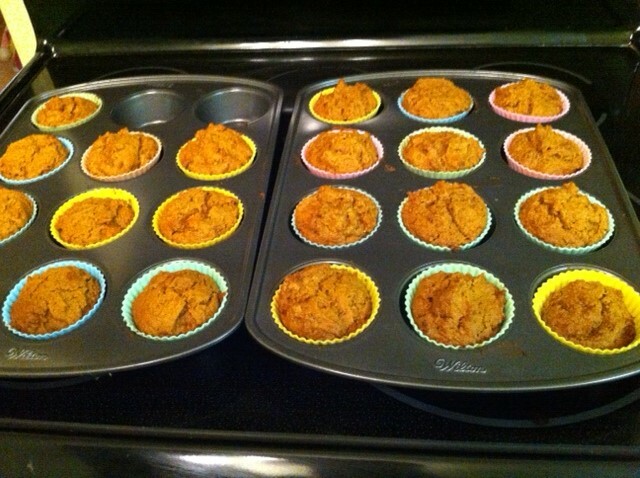 Note – depending on the size of muffins you want and your sweet potatoes used, this recipe yields about 12 – 24 muffins. I usually find it makes about 18-22.